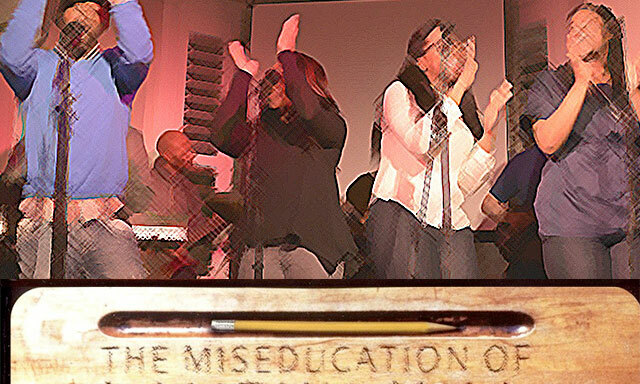 When the structure of this music ministry collapsed on top of me, my healthy relationship with Jesus got trapped under the rubble. I used to be passionate about this stuff. Then disappointments broke me. Church culture frustrated me. Hurt changed me. I started to hate everything about gospel music… about church… about God… and even my own talents. Where the music business was about glamour, image, and popularity, worship was to be something more noble. Our songs were changing lives, doing something cosmic and transcendent, breaking mental and emotional chains. I thought there was power in it. But in hindsight, it seems all we were doing was just singing songs. Sometimes we were like the “opening act.” At its worst, it felt like we became the pastor’s jukebox. But I did it anyway. I really loved to sing. And God’s people needed us to help them lift their heads, hands, and hearts. Then I noticed people’s reaction to worship was mirroring that of any other form of entertainment. They clap and engage when they like it, or stare blankly when they don’t. There was pressure to elicit a response though. If not, we might be sent back to sing more songs (as if our job was improperly done). Or chastised to sing with more passion. Or worship more in our private time. Go on a fast. Get into the Word and activate your anointing. Practice longer. Do something. But one way or another, we needed to get results. The thinner I was stretched, the angrier I got. Obligation piled on, while appreciation fell off. I didn’t have permission to rest. If someone would’ve just told me to take a break, I might not have short circuited and quit everything. All those years rehearsing, studying, performing, and sacrificing, I thought I was building something sacred and significant. It wasn’t magical. It didn’t save Robin. What can it do for me? I knew my time there was coming to an end when simply entering the church parking lot made me intensely angry. One day, I looked around and decided that whatever this was, I didn’t want to do any of it anymore. And it was abrupt when I left. I’m sorry about that. It was unfair to those who remained, but I couldn’t stay another moment. (1) Part of offering people faith involves believing in the product you’re selling. So it makes sense to happily laud its benefits. But even the most harmless products still require an FDA warning label. I wish someone would have done a better job warning me worship wouldn’t protect me from life happening. This is #1 in a 5-part series called Exit Wounds: Song of an Ex-Worship Leader.